Art Pepper (1925 - 1982) was described as the greatest alto-saxophonist of the post-Charlie Parker generation. 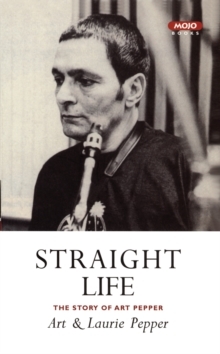 But Straight Life is much more than a jazz book - it is oneof the most explosive, yet one of the most lyrical, of all autobiographies, narrated on tape to his wife Laurie. Pepper refuses to tiptoe round many of the unpalatable episodes of a life that involved alcoholism, heroin addiction,armed robberies and five of what should have been his most productive years imprisoned in San Quentin. The result is an autobiography like no other, a masterpiece of the spoken word, shaped into a genuine work of literature.